Liberon...all you need for that special finish! 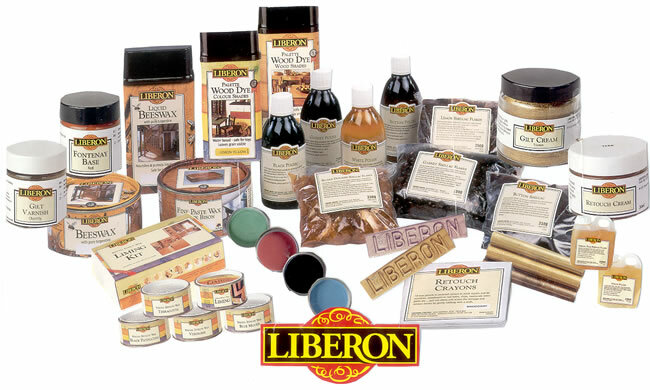 Please click on any of the links below to view our seletion of Liberon products. To order, call (718) 815-8802, or fax an order form to (718) 720-7027. Liberon's Black Bison is a precise blend of waxes, chosen carefully to feed wood & enhance its natural beauty. French polishes are available in a range of colours; the finished effect is dependent notably on the colour of the wood, but also on the colour of the french polish applied. Dark brown in color; used to create an aged effect on all types of wood. For removing old wax, dirt, and grime from furniture prior to refinishing without affecting most original bar finishes. Ideal for removing bloom marks from waxed surfaces. Removes white heat and water marks on most hard surfaces such as varnish, french polish, lacquer and modern finishes. 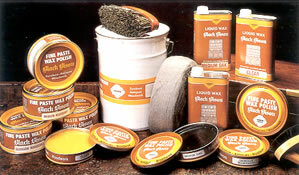 For waxed surfaces, use Wax & Polish Remover and rewax with Fine Paste or Liquid Wax (Black Bison). Green hues of oxidized copper and brass.